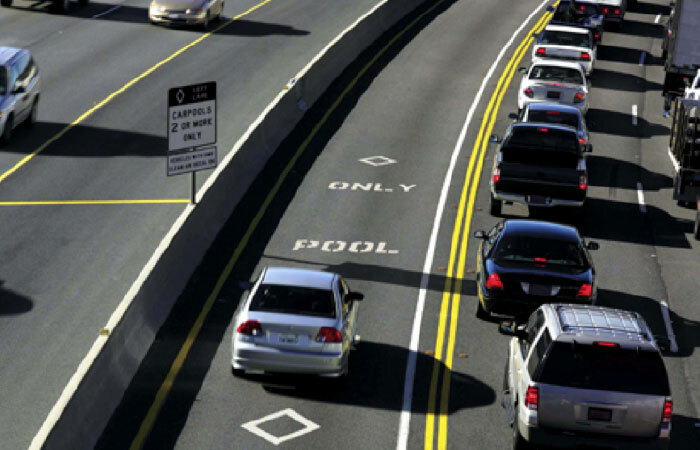 Should Bay Area carpool lanes be enforced 24/7? Bay Area traffic is worse than ever. Whereas traffic jams were once restricted to typical rush hour (7-9 AM, 4-6 PM), congestion now extends earlier and later past the peak periods. For some corridors, such as the Eastshore, Nimitz, and Bayshore Freeways as well as most toll plazas, weekends are often just as bad as weekdays. Moreover, few alternatives exist to driving outside of rush hour: BART, Caltrain, and other transit services are often too infrequent to offer a dependable alternative. Given this worsening gridlock, carpooling would seem like a great solution to help reduce the number of cars on the road. In Southern California, for example, carpool lanes are active 24/7 to incentivize carpooling during all times of the day. However, the Bay Area’s carpool lanes are only active part-time during traditional commute hours (Monday-Friday 6-10 AM and 3-7 PM), meaning that a vehicle with five occupants is subject to the same delays as a single-occupancy vehicle. While this general characterization of traffic patterns between the two regions may have been true a decade ago, times have clearly changed. Carpool lanes should be for carpoolers during all hours of the day: it is bad policy for the “green” Bay Area not to incentivize carpooling during certain times when traffic solutions (and greenhouse gas reductions) are still badly needed. With a few possible exceptions, the Bay Area should follow the lead of Los Angeles to implement 24/7 enforcement of carpool lanes.